I loved making baby food purees for Little Pea. Even before she was born, I was hoarding baby cookbooks and all kinds of baby food gadgets and doodads (doodads! I sound like a grandma!). I used purees as a way to introduce not only fruits and vegetables, but herbs, spices, and other flavors too. 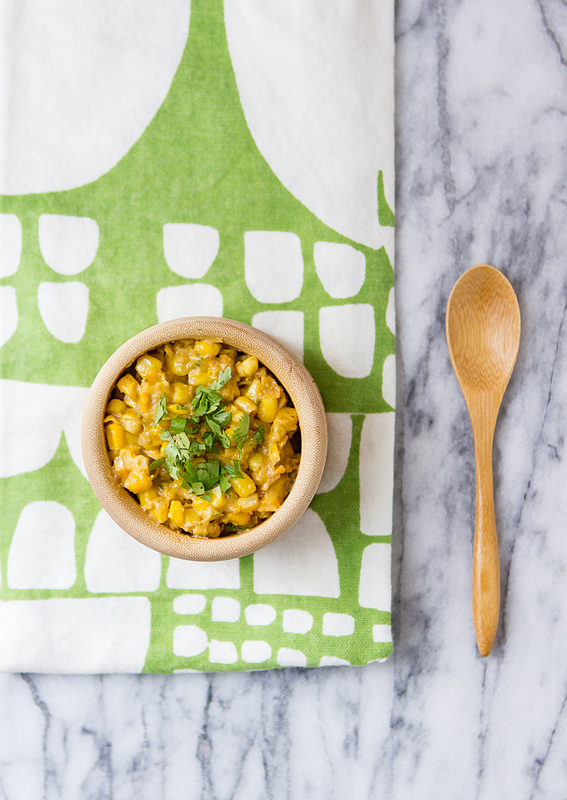 This Coconut Creamed Corn is one of my favorite baby food recipes because it works for every stage—it can be pureed for babies without teeth, it can be made into a chunky mash (pictured here) for older babies, and it can be made without pureeing at all for everyone else. There’s a minimal amount of ingredients in this recipe, but there’s still a lot of depth to it because the corn is caramelized in the skillet before simmering in the coconut milk—this makes the resulting dish a little darker than traditional, pale creamed corn you get out of the can, but the flavor is much more satisfying. 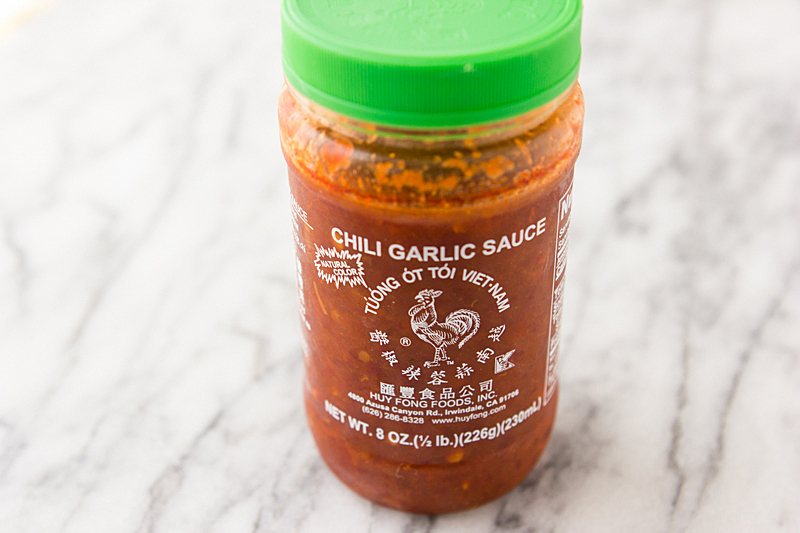 There’s a half teaspoon of chili garlic sauce in here, but don’t worry, it’s not enough to make this hot—it just adds a bit of a kick. If you want, you can omit it altogether, but you might be surprised to find your kiddo likes spicy food. People always have weird reactions when I tell them Little Pea eats sriracha and Indian food, but there’s really no reason not to feed toddlers food that’s spicy as long as you’re not putting ghost peppers in their grilled cheese. If corn is still in season where you live, it’s probably the last week you’ll be able to buy it before the season is over, but I’ve tested this with frozen corn too and it works just as well—although, I’ll be honest, frozen corn is never quite as good as the fresh, local version. Just be sure to choose a high quality brand—don’t cheap out! I like Cascadian Farm corn because it’s organic and grown in the US. Corn is caramelized in a skillet, then simmered in coconut milk. Serve it to babies as a puree, but the rest of the family will love it too. Heat the oil in a large skillet over medium-high heat. Once it's melted and shimmering, add the green onions and corn. Cook the corn for about 5 minutes, stirring occasionally, until it's beginning to brown and caramelize. Reduce the heat to medium. Pour the coconut milk into the skillet and stir in the chili garlic sauce, if you're using it. Cook for about 2 minutes more, or until the coconut milk has reduced slightly. There should still be some liquid at the bottom of the skillet when it's finished. Remove the skillet from the heat. If you're making this into a baby food puree, let the corn cool a little bit, then transfer it to a blender and blend until smooth—you may want to add water or breastmilk to thin it out a bit, depending on the age of your baby. For a chunky mash, puree one cup of the corn, then stir it back into the skillet, adding a bit of water if needed. The creamed corn can also be eaten as-is, without pureeing. If you're serving the corn as-is or as a chunky mash, garnish with cilantro and a squeeze of lime juice before serving, if desired and add salt to taste for older kids and adults. This recipe can be frozen for later! It will keep for up to 3 months in the freezer.